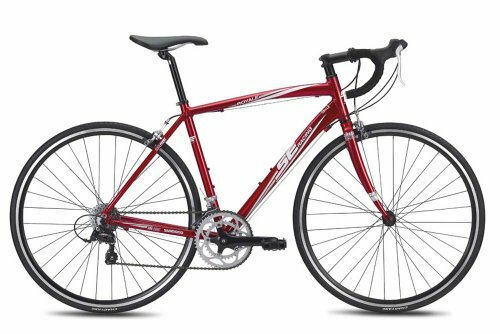 The SE Bikes Royal (16 speed) is an entry level bicycle which comes to you with a complete package of speed, performance and durability. It is equipped with an aluminium frameset which makes the bike light as well as strong. The bike has been equipped with a carbon fork which does an excellent job in absorbing the undulations of the road ensuring a smooth ride quality. The Shimano equipped with drivetrain of this bike ensures smooth, fast and précised gear shifting while the Alloy Caliper brakes provide sheer braking force coupled with superior precision and control. The alloy drop bar handle bar and the SE saddle of this bike offer a comfortable ride position. This bike is ideal for budding riders and professionals who are looking to take their biking to a new level. If you are somebody who wants to get started with biking and want to get a taste of what it feels like, this bike will serve you equally well. The smooth ride quality offered by this bike coupled with comfort and reliability makes it an excellent commuter bike as well. The price tag associated with this bike is extremely reasonable and it delivers value for your money. The bike comes with SE1 Alloy Frameset with H2O mount; SE1 Alloy Rear Triangle with Replaceable Hanger; Carbon Fork with 1 1/8’’ Alloy Steerer; Lasco 50/34T Crankset (8 speed); Square Taper Sealed Bottom Bracket; 1-piece Resin Bodied Boron Axle Pedals; Shimano Claris Front Derailleur (31.8 millimetre); Shimano Sora 9 speed Rear Derailleur; Shimano Claris 16 speed Shifters; Shimano HG51 Cassette (8 speed, 11-28T); KMC 8 speed Chain; Alloy 32H Wheels with Double Walled Rims; Alloy Formula Hubs; Road 30 tpi Tires (700 x 25C); Alloy Road Caliper Brakeset; Shimano Claris Brake Levers; Neco 1 1/8’’ Headset with Caged Bearings; Alloy Drop Bar Handlebar with 31.8 millimetre Clamp; Alloy Stem (7o Rise) ;SE Saddle with Foam Padding and Steel Rails and Alloy Seatpost. The SE Roayal Bike is an entry level road bike which can be used for riding, exercising, commuting or just for coasting along your city or town streets. Equipped with an aluminium frame, the bike is sufficiently light and strong. It handles the road pretty smoothly which can be attributed to its carbon fork which absorbs the hits and bumps off the road quite efficiently. The gears of this bike do not meet the expectation. Gearing is not as smooth as expected and shifting to the right gear sometimes takes a lot of effort. The saddle of the bike is not very comfortable and the wheels are also on the thinner side. For getting the best out of the bike, you will have to replace the wheels and the saddle and get the gears tuned in properly. Overall, the bike looks good as an entry level bike. The price tag associated with this bike is extremely reasonable and this bike is perfect for entry level riders.